You'll get the beautiful straight teeth you've always wanted without wires and brackets. Invisalign® is a series of clear aligners that straighten your teeth without the usual noticeable, bulky materials involved with traditional braces. 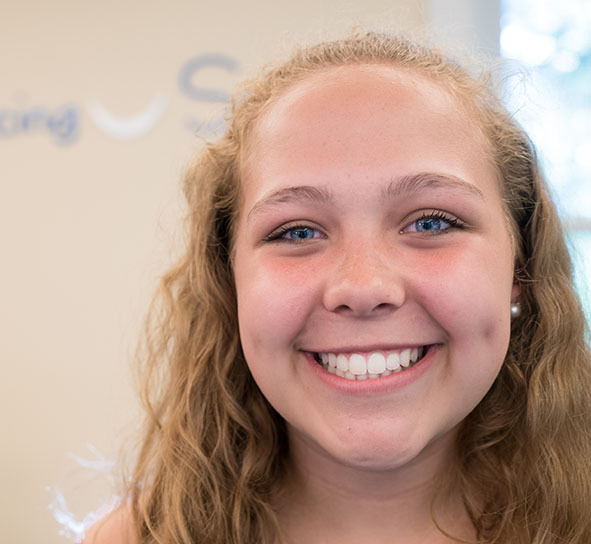 Designed for both teens and adults, Invisalign clear aligners transform smiles and lives. Teens reveal their best smile through a unique treatment developed just for them, while adults get the smile they’ve always imagined without putting their lives on hold. Invisalign® Teen aligners are removable and virtually invisible, which means you can straighten your teeth more discreetly and comfortably. Unlike traditional braces, you can still eat and drink what you want as well as brush and floss normally to maintain healthy gums and teeth. There’s never been a better time to get the smile you’ve always wanted, and there’s never been a better way to do it! No brackets, wires, or food restrictions. With virtually invisible Invisalign® clear aligners, you keep living your life while you transform your smile. While you’re straightening your teeth with Invisalign® clear aligners, you can keep brushing, flossing, and maintaining your oral health like you’re used to. as metal braces. And just like braces, they’re included under most dental insurance policies. Of course, the real value lies in being able to smile with confidence.